The Matrox Radient eV-CL is a Camera Link 2.0 interface capture card. It supports up to four Camera Link Base, or two Camera Link Full, cameras. Matrox Imaging Library (MIL) is a comprehensive software development kit (SDK) for machine vision. It powers capture, manipulation and analysis of both 2D and 3D images. MIL LITE is a software development kit that enables image capture, display, annotation, and archiving. 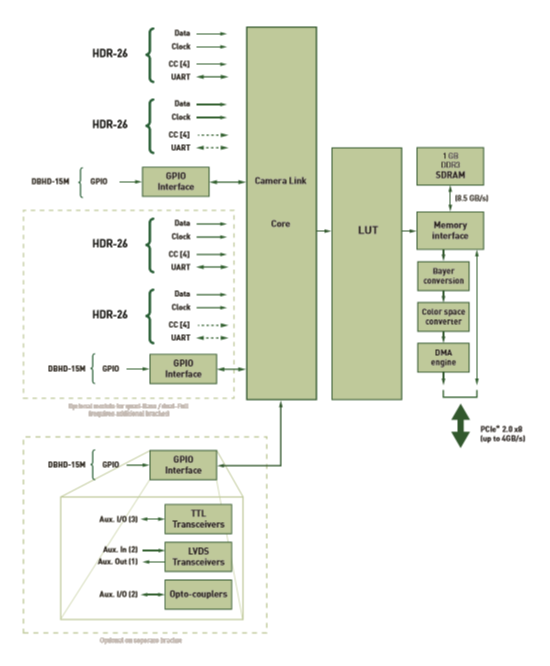 Matrox FPGA Development Kit (FDK), for use with the RadientPro CL, enables development of custom field-programmable gate array configurations. Please see the Resources tab for links. Available in North Central US. This product is warranted by the manufacturer to be free from defects in materials and workmanship under normal use for a period of one (1) year from the date of original factory shipment. For further information, please refer to the manufacturer's website. Due to the manufacturer's policies, orders cannot be cancelled once they have been confirmed by the factory. Returns will not be accepted unless the item is defective under warranty. Items configured with options marked NC/NR cannot be cancelled, nor returned.